1970 Plymouth Cuda Rocker Moldings Fish Gills set. Sold as a two piece set. 1970 Plymouth Cuda Body Bumper Kit w/Adjustment Studs. Authentic Mopar Reproduction product. Fits all 1960s-1970s Mopar Dodge Plymouth Cuda Challenger Charger Sunvisors with pin rods. Sold as a pair. It's time to replace those wore out muffler hangers. We've got a nice, accurate reproduction set of E-Body Cuda and Challenger Tip/Muffler hangers now available. 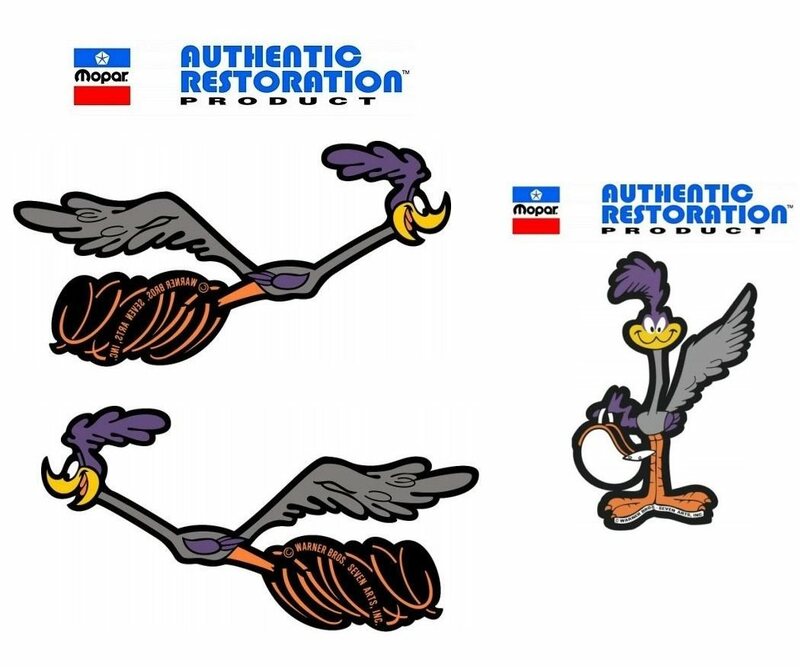 This decal package is correct for 1969-1974 Road Runner, sold as a pair of running birds and one standing bird. This package is factory correct with reflective vinyl and multi colors as original. Watch out for generic copies that are not reflective. These replace original decals. This decal package is an Authentic Mopar Restoration product, this means it is the very highest quality you can buy...for those restorers that want the very best! Authentic Mopar Restoration Decals are the exact same size, shape and color as original.